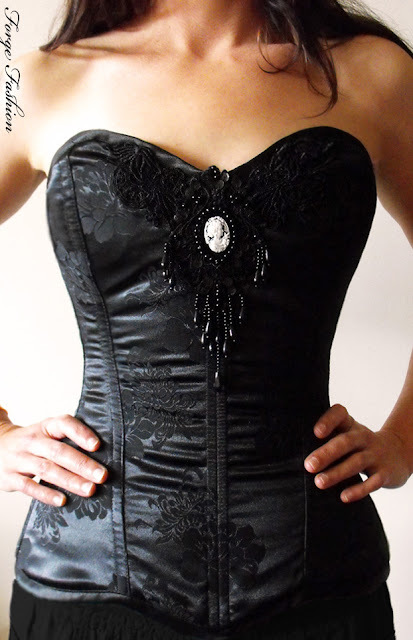 So the adaption of my 'Basic Curvy' cut corset was a success (remember how I ended up with a demi bust on my first sample instead of full overbust), so I have made a few different sizes in this style. The first (above) a size 20" with stunning detailing & a wonderful cameo, another in tarten, size 24" which I'll be sure to post soon. I am always busy trying to do something (like most of us are) - right now it's trying to finish up various odds and ends, from things laying around half finished from eons ago, to more recently prepared samples.......it ultimately means I can put it all up for sale in my ETSY shop for the period while I'm not taking orders. *Lets just say with another move planned (back across the Islands) and a new baby arriving I have to be on the ball where possible! This is definitely one of my faves... it's sooo pretty! Loving the cameo as well!